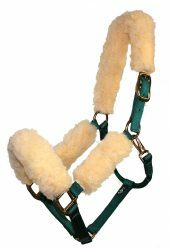 Halter tube kit is constructed with soft poly fleece. Kit contains 2-5" cheek pieces, 1-10" nose piece and 1-16" crown piece. Quality constructed in the USA. (Halter not included).